Best Buy and Microsoft have come to an agreement that will see the retailer install mini Windows stores in more than 500 locations in the US and 100 across Canada starting this summer. Dubbed the Windows Store, the areas will fill existing space used to showcase computers and will range in size from 1,500 to 2,200 square feet, Microsoft said. 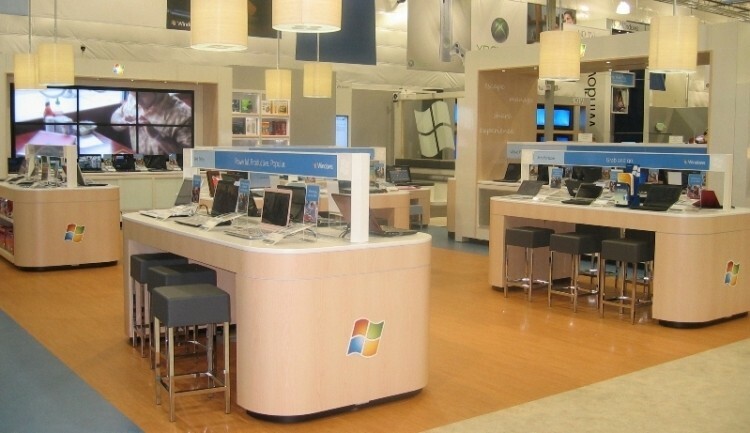 Chief marketing officer and chief financial officer for Windows Tami Reller said it’s a big deal for Microsoft to make sure customers have a hands-on experience which is exactly what the store-within-a-store will offer. The retail chain plans to staff the Windows Store with more than 1,200 employees that will be trained specifically to sell Microsoft’s products. All sounding a bit familiar, you say? Well, you’d be correct as just Samsung partnered with Best Buy just two months ago to open 1,400 mini stores of their own. The Samsung Experience Shop, which are already set up in a number of locations, consume up to 460 square feet of floor space and are also staffed with employees that have been trained to sell Samsung’s latest and greatest. The store-in-a-store route seemingly makes sense for everyone involved as Microsoft and Samsung have struggled to find an answer to Apple’s retail dominance. What’s more, it’s good news for Best Buy as they’ve had a tough time competing with online merchants that are able to undercut them by not charging sales tax.